This summer a packrafting adventure in Montana’s Bob Marshall Wilderness Area proved more exciting than planned when the Bear Creek wildfire escalated from 40 to 4000 acres over the course of only four hours. The Wild Confluence film-team was 6 miles from the fire that had flame lengths exceeding 200 feet when they received news that their exit point was on fire. At that point, the only way out was to hike 30 miles in the opposite direction over a high Western pass. Luke Kantola, co-founder of adventure film company, Wild Confluence, reflects on the experience through images captured on the trip. 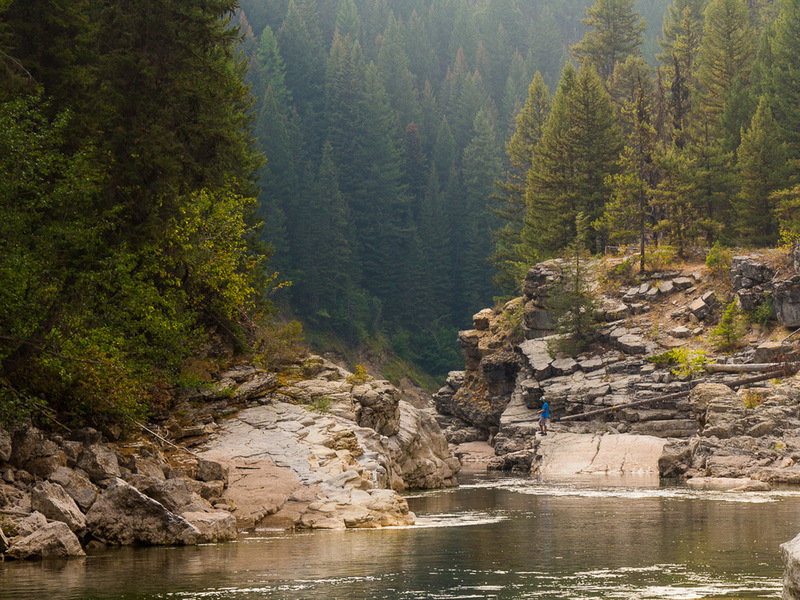 A week long self-supported trip along the South Fork of the Flathead River. Three days of up-stream hiking set the stage for four days of floating back to the trailhead with the unexpected twist of needing to escape a rapidly growing wildfire by foot. The South Fork of the Flathead River is an outstanding river that cuts through one of the largest roadless wilderness areas in the country. The Flathead River is the longest unregulated river in the United States; meaning that it’s banks are allowed to meander freely creating a truly wild place. Without roads the fish are under less pressure making them huge and very abundant. The first few days of the trip were spent hiking thirty miles, up-stream, along the banks of the remote river. Hiking under the weight of a week’s food, camera gear, fly fishing tackle, and rafts was strenuous, but the context the hike would provide during our float back made the it well worth it. We arrived at our put-in on the river a day early and spent a long afternoon fishing and lounging by the banks. The trip from this point on was full of excellent fishing; the most plentiful of my life. Most of our meals consisted largely of cutthroat trout that we caught ourselves. We began packrafting the next day, but we stopped frequently to swim, fish, and rest in those small hidden nooks that are only accessible when floating the water. We ate the fish that we caught from the river and our lives quickly took on the pace of that wild place. For three days we floated the river, but our last river mile before our final camp brought a sizable increase in a nearby smokestack we had been watching. 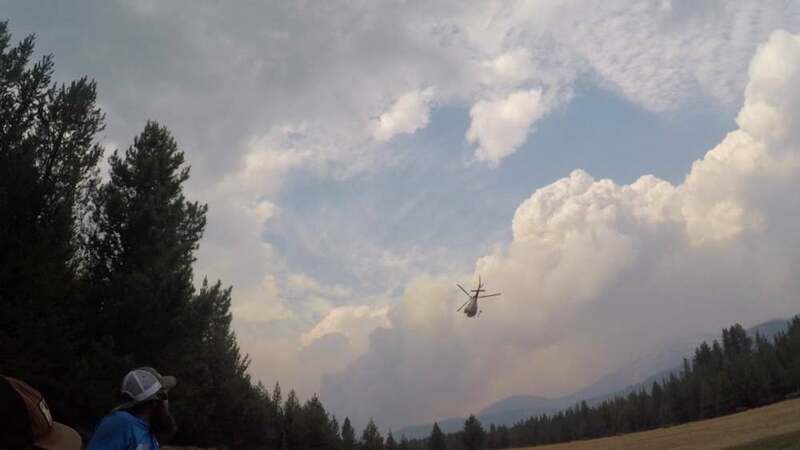 It was around 11 pm when Forest Service Ranger, Cole, came into our camp and told us that we were within six miles of the now four-thousand acre fire. Cole told us about the fire: two-hundred foot flame-lengths, torching trees, and rapid growth. While it doesn't take an expert to make that sound scary it was the professional wild land firefighter in our group, Charlie, who was able to contextualize the situation. Following his lead we decided to evacuate our camp that night. Our retreat took place around midnight and we hiked three miles back upriver on the same trail we had hiked in on a week earlier. By headlamp we navigated the sometimes confusing trail system. We were able to recognize elk rubs and game trails that we had seen when we hiked in. With no view of the surroundings due to the moonless night these naturalist notes became our guiding light. We slept near the remote cabin where Cole was stationed and watched the fire throughout the night. The next day we met up with Cole. Shortly after, the winds picked up and our visibility was limited to less than a hundred feet because of smoke blowing in. The fire was coming. Another Forest Service ranger spoke matter-of-factly with a slight cynicism in his voice. He told me that a another helicopter evacuation would be impossible with the low visibility. He added that with conditions as they were no one would know where the fire was until it was too close for comfort. The only option for our group was a thirty-mile hike out over a high western pass. Our team had three Pacific Crest Trail thru-hikers on it, myself included, and I knew for the three of us that a thirty mile day would be no problem. It was a success, and when the sun had set and we dropped down into the far off parking lot there was a van from Big Sky Outfitters waiting to bring us to a camp with hot showers, pizza, and beer. Be sure to check out the full film under our Media page: "Listen to the River"